Our Beef au Jus Gravy Mix brings a rich, delicately seasoned flavor to any dish, which serves as the perfect addition to anyone's kitchen. Plus, our Beef Bourguignon is a tasty addition to anyone's recipe book. Steak can be enjoyed in countless ways. Follow these tips to cook tender, juicy steak you can’t resist. Have a question about this product? Ask our Knorr community and get answers from real people. Beef au Jus is rated 4.5 out of 5 by 6. Rated 5 out of 5 by CarolB11 from Beef au Jus Top on my list , can be used in so many ways to mention , adds the flavor , richness and puts the yummmy in the meal. Rated 5 out of 5 by jmeyers5295 from Awesome Flavor! I used the Au Jus gravy instead of beef broth and water to cook my roast in a crockpot. It was by far the best and most flavorful roast I have ever made. My family loved it. Rated 5 out of 5 by Gail from Excellent for any beef recipe! I use this au jus with stew, gravy, and soup. It gives an excellent beef flavor, just like homemade. 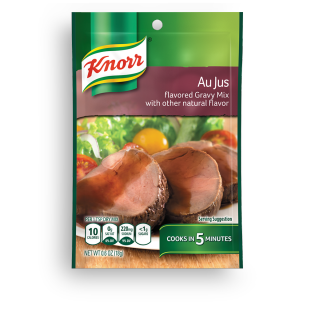 Rated 5 out of 5 by Vols from Incredible Flavor Knorr Au Jus is our favorite of all their sauces. If you ever make a prime rib, adding this Au Jus is an absolute must along with some horseradish cream sauce. We also thinly slice left over steak or beef and place it on a baguette and enjoy a French Dip Sandwich. This incredible sauce tastes homemade and elevates numerous dishes.